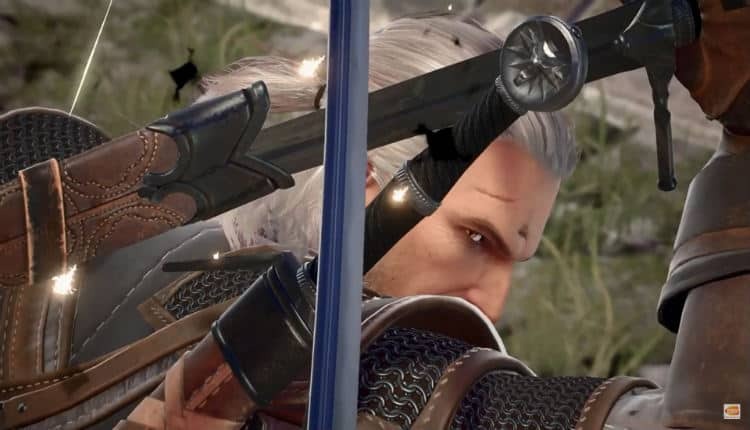 Soulcalibur 6 Welcomes Geralt of The Witcher | Nerd Much? Bandai Namco dropped a trailer this morning confirming what many had hoped. The Witcher‘s Geralt of Rivia is joining the Soulcalibur 6 roster. We knew we were getting some type of Witcher announcement today. And while many hypothesized that Bandai Namco would indeed be bringing Geralt into Soulcalibur 6, there was always a shot it could have been another Gwent reveal of some sort. The Soulcalibur series has a history of guest stars joining its roster. Previous iterations of the game have seen some pretty iconic names enter the fray. Most notably amongst them being Link from The Legend of Zelda series, and Darth Vader and Yoda of Star Wars. Previously, the series’ guest stars were tied to console exclusivity. Soulcalibur 2 featured Heihachi Mishima on the PlayStation 2, Spawn on the Xbox, and the aforementioned Link on the GameCube. Soulcalibur 4 continued this trend with Darth Vader on the PlayStation 3 and Yoda on the Xbox 360. The exclusivity ended with Soulcalibur 5 though. Both the Xbox 360 and PlayStation 3 versions featured Ezio Auditore da Firenze from Assassin’s Creed: Brotherhood. As well Devil Jin’s unlockable move set from the Tekken series. It’s unclear whether Geralt of Rivia will be the only guest character for Soulcalibur 6. The Legendary White Wolf appears to use a mixture of swordplay and magic during combat. You get a quick glimpse of his fighting style in the trailer above. Geralt’s original voice actor, Doug Cockle, is on board to reprise his role. The character will have his own personalized stage as well in the form of Kaer Morhen. The stage’s soundtrack will feature the song “Hunt or Be Hunted” from The Witcher 3. Critically, the Soulcalibur series is one of the greatest fighting franchises ever. And with a fantastic guest character locked in, it’s all the more reason to be hyped for Soulcalibur 6. The title launches on Xbox One, PlayStation 4 and PC later this year.